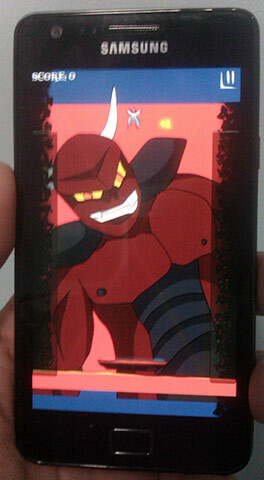 This week I completed the last demon and started testing on an Android device (pictured above). A lot of it is working quite well. I found a bunch of bugs including the expected one where you can’t tap on 2 buttons at the same time. So, I’ll have to redo the button code. Hopefully it’s not too hard. What’s next: fixing bugs and starting design work on the start menu including a new logo. Looks good man, except for those responsive issues, heh. If you make your app container at a fixed ratio and center it, you could probably save yourself a lot of trouble, although you would have black bars on some devices which isn’t ideal. I got curious about handling multi-touch gestures after reading this post, and apparently its pretty easy to make something support multi touch, on Android at least. The events have a ‘pointer ID’ which is a way to track each finger on the screen. All you’ve gotta do is make sure the ‘button up’ event responds to the finger which was originally pressed onto it. You gave me a shot of confidence to start supporting multitouch right from the start. It’s not so scary! Thanks man! actually the responsiveness is already sorted. Just gotta hide those extra sections which I’ll do later. Yea, I read a bit about the mutli-touch thing. Hopefully it goes alright.